Earn $1.35 in VIP credit (135 points)What's This? 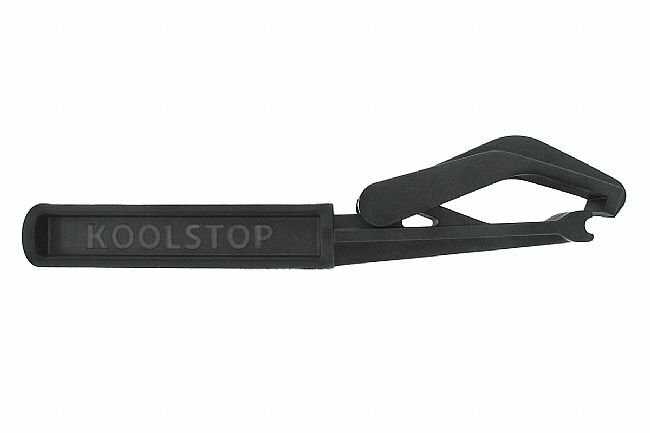 The Kool Stop Tire Bead Jack is an articulated tool, with a comfortable grip, for installing really tight tires. The articulated end uses the rigid piece against the rim edge as a fulcrum while the hinged end lifts the bead up and over the opposite edge of the rim. This is a great tool for dealing with difficult tires. This makes life a little too easy. I almost miss the challenge of putting on tight fitting ties with my bare hands until my palms are blistered, then resorting to using tire levers and pinch-flatting a couple of tubes. Ha! Never again! I ride a touring bike with a giant seat pack and keep this with me all the time. Extra leverage for mounting tires. The Kool Stop Tire Bead Jack provides extra leverage for mounting those hard-to-mount tires. However, you must be careful not to pinch the tube when you grip the tire. It may be better for mounting tubeless tires. It works fine at home but it is too long for most seat bags or jersey pockets so it's not easy to take on the road. After a 2hr. struggle with Schwalbe tires and Mercury carbon rims I gave up. Saw the bead jack and gave it a try. 5 min. to mount 2 tires. Hooks over bead and levers over rim edge. If using tubes avoids the dreaded tube pinch.. Makes the first mount of tight tubeless tires to tubeless rims fairly easy. One of the top tools I have ever purchased for making your mechanic life easier. With 2-way fit rims, I always struggled to install new tires. Occasionally, I would pinch the new tube and have to remove and reinstall the tire. Since I got the Kool Stop Tire Bead Jack I have not had any problems - installation is now relatively easy. One of my best purchases.